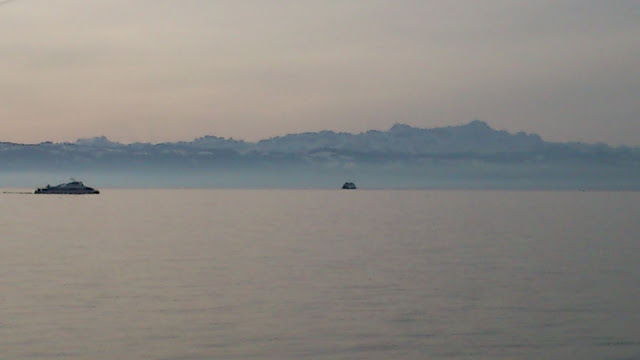 A Katamaran and the car ferry seen in front of the Swiss Alps on Lake Constance (as seen from Friedrichshafen). Ever heard of a radio station "DB2 FM", ever tried to listen to it? If you prefer streaming radio, why not start up the music service "db2fm" on your console...? What does it mean to a high-powered database server (lots of CPU cores, plenty of memory, fast and big disk system) when the bufferpools are tiny? What happens with a CPU with lots of cache when only few registers can be used? What happens with human brain if the so-called working memory is impacted by epilepsy-related medication or surgery (see my earlier posts related to epilepsy and IT)? All of the three mentioned systems cannot utilize their full capabilities, throughput is limited because an important component is impacted. But what can be done to improve throughput? The key is to change the strategy and to deal with the shortcomings. In a database server like DB2 or Oracle it would be to improve selectivity to reduce the data to be processed, to create indexes to avoid access to much data, and to enable data compression so that less data is moved. For software running on a system with too fw registers it would be to change algorithms, so that, e.g., fewer operands are handled. How does someone cope with memory problems caused by epilepsy? Our son has occupational therapy to develop strategies for more efficient use of his working memory and also to train (build up) his capabilities. The Epilepsy Society has this summary on the memory issue and workarounds that can be used like sticky notes (external memory), task lists, etc. About a week ago I had asked how you typically find information about DB2 fixpacks. With the new DB2 10.1 Fix Pack 2 and Data Studio 3.2 just released (and I back from travel), here is the way I usually trying to stay in the loop. A good starting point is the IBM Support Portal. It requires a so-called "IBM ID" to manage a profile. There you can define RSS news feeds or email subscriptions to many of the IBM products, including the Information Management offerings. Information you can subscribe to include new or update Technotes (example: updated Technote on recommended fix packs for Data Server Client Packages), on fixes (example: IC84157, Crash recovery may fail if the mirror log...), product and packaging information (example: Mobile Database now included...), etc. Once the new fixpack is available I usually first read the Fix pack Summary in the DB2 Information Center. It describes the high-level changes in the fixpack. On the support pages you will also find an overview of the available fix packs for the different supported versions of DB2. When you click on one of the fixpacks, there are additional links leading to, e.g., the list of security vulnerabilities, HIPER and special attention APARs fixed in DB2 (here V10.1, FP2) or the list of the fixes (fix list) for that release. By the way: HIPER stands for High Impact or PERvasive, i.e., bugs with critical impact. APAR is Authorized Program Analysis Report and basically is a formal description of a product defect. Customers usually open a PMR (Problem Management Report) which may lead to an APAR (or not).